It’s pretty mind-blowing how much William Shakespeare has influenced our language. He’s been gone about 400 years, but we keep using his expressions. All of the following oft- repeated phrases come from the Bard of Avon. Some of them have been altered over time, but I bet you recognize most of them. How many times have you used these expressions, or heard them used? How many did you know originated with Shakespeare? Can you identify the works from which they come? Any of them? Great comment, Fred! I’m wondering what words you’ve coined! The statistic I’ve encountered here and there is that Shakespeare created about 8.5% of the words he used. Isn’t that amazing? A part of that fact, I’m assuming, is that Shakespeare’s is the first documented use of many of those words. But whether he was making up the words or simply had the literary momentum to get them into print and make them stick, it’s still really something. A humorous side note is that we writers of fantasy fiction tend to make up words, too, so hearing that about Shakespeare makes us happy. We feel like we’re carrying on a grand tradition in the best of company. 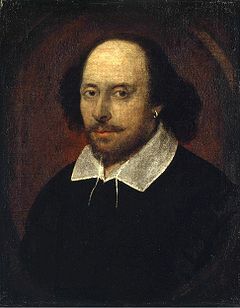 All I can say is, Shakespeare is lucky he didn’t have a spell-checker on his computer, because under the onslaught of “fire-new words,” it would have been beeping at him non-stop!